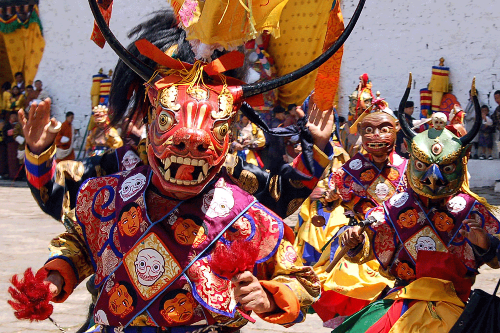 Thimphu festival is the popular and biggest festivals of Bhutan. You will see many Bhutanese people coming in their finest and expensive attires mostly woven from silk and with grand picnic lunch for the festivals. It’s an opportunity for taking lots. 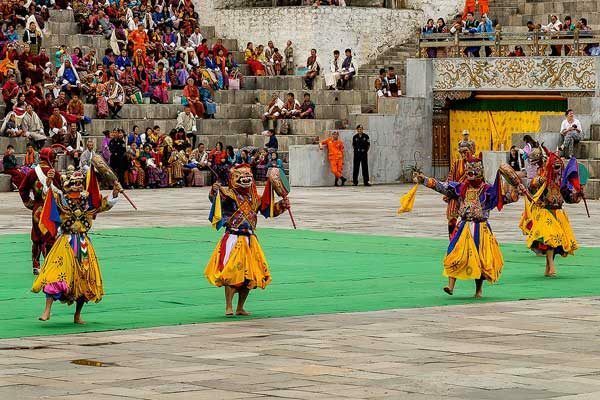 Thimphu Tsechu is by all means one of the biggest festivals in the capital of Bhutan. 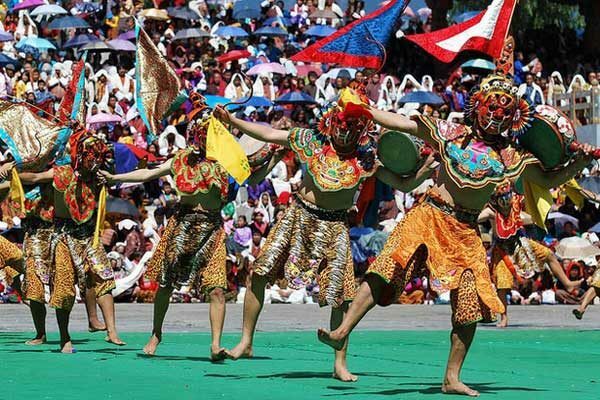 Celebrated annually in the autumn season for a period of 3- 4 days, this festival is a ceremony of colors with a happy amalgamation of the changing nature and the many moods of the Bhutanese culture. 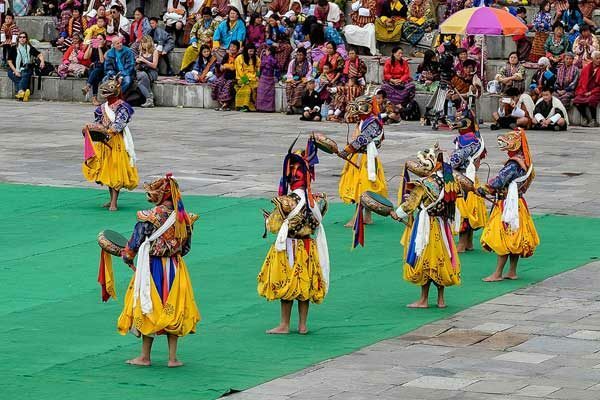 The highlight of Thimphu Tsechu is the showcase of ethnic folk dance in the famous Tashichho Dzong in Thimphu. 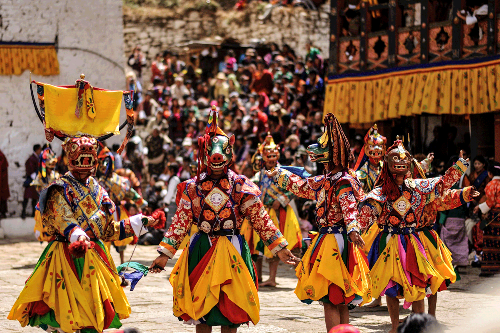 The court yard of this Dzong is the platform for the performances that is marked by traditionally designed colorful masks. 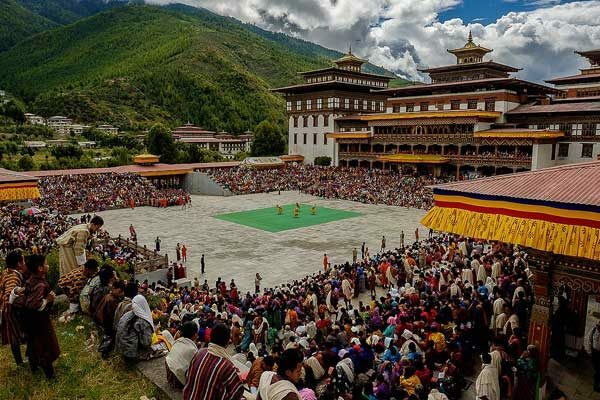 Essentially a religious event, Thimphu Tsechu holds spiritual significance for the people of Bhutan who crowd the streets of Thimphu during that time of the year. 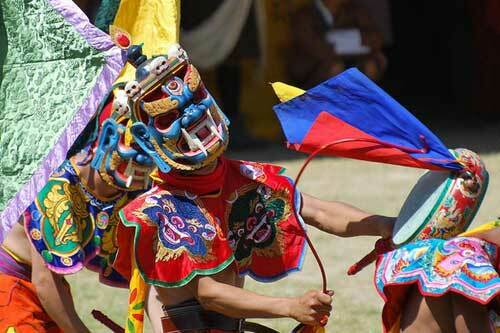 The dancers in the festival are both monks and common men. When they move to the beats of the drums and cymbals, the whole atmosphere wears a celestial look. 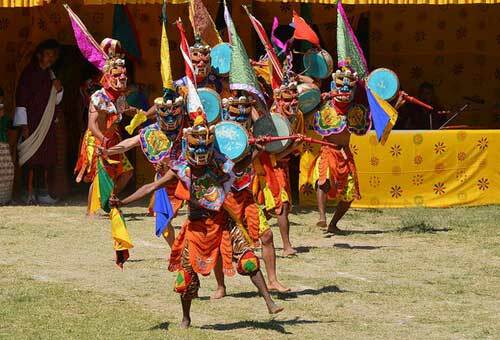 This pious event was believed to be originated in the year 1670 during the reign of Tenzin Rabgye. Since that time, Thimphu Tsechu occupied a major part in the Bhutan social history. The celebrations witness the people joining the event with families and friends and spending quality time with them. Your flight to Paro will provide you a wonderful experience with a view of various high snow capped mountains of Bhutan and Mt. Everest on a clear day. 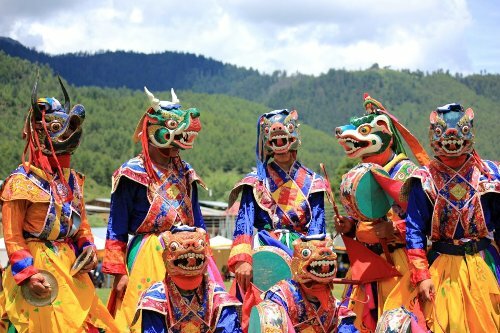 Upon arrival at Paro, our representative from Bhutan Travel Adventures will receive you at the Airport. Visit Kyichu monastery dating back to the 7th Century. This is one of the oldest monasteries in Bhutan built by Tibetan king Songtshen Gempo to pin down the ogress. Afterwards visit the historical Drugyel Dzong which is a ruin fortress now, built by Shabdrung in 1649 to commemorate the winning victory over the Tibetans in 1644. Thus Drugyel Dzong means the Bhutanese victorious fortress. Drive to Thimphu for 1 ½ hrs. After checking in at the hotel you could have rest for a while, and later walk around the city to see the life of urban Bhutan. Overnight stay in Thimphu. In the morning, drive 10 minutes to the Buddha point to see one of the largest statues of the Buddha in the world. Also the Thimphu city is best viewed from the Buddha point as well. Later visit the school of Arts and Crafts which was established to preserve and promote our age old practice. The students here are taught 13 different traditional arts and crafts. Visit the folk Heritage museum, to see the house of living traditions in some of the rural areas or the living house in olden days. Visit our National library next to the folk museum. And visit the mini zoo to see the Takins which is our national animals. After lunch you can visit the Handicraft emporium for your souvenir shopping. Visit the Memorial stupa which was built in the memory of our beloved 3rd King in1974. Overnight halt at the hotel in Thimphu. As a last day of the festival, just few mask dances will be performed until afternoon. 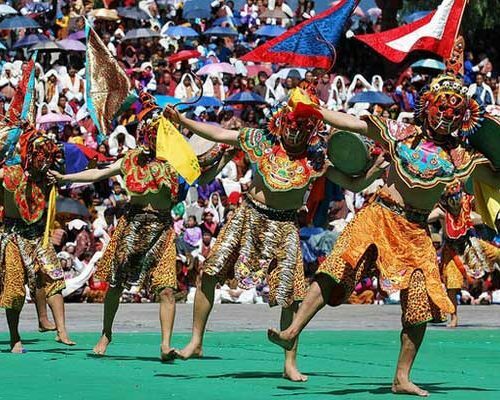 Some cultural songs and dances will be also performed in between for the viewers during the festivals time. After your lunch drive for half hour for your hike to Tango Goenpa (Monastery) for about 1.5 hours to and fro. Lama Gyalwa Lhanampa founded the monastery in the 12th century. The present building was built in the 15th century by the Divine Mad Man “Drukpa Kuenly”. In 1616 Shabdrung Nawang Namgyel visited Tango Goemba and meditated in a cave nearby. Today Tango is the residence of an important young Trulku (reincarnate lama) who is recognized as the 17th reincarnation of highly respected forth Desi, Gyalse Tenzin Rabgye, whose previous reincarnation passed away in 1830. Also at present the monastery serves as the prestigious Buddhist University for the monks of our state religion. You may also see some birds around this vicinity’s forest. After your hike drive back to your hotel. Overnight stay in Thimphu. After breakfast, Drive to Punakha for 2 ½ hours with short stop at Dochula pass. If the weather is clear, you could have a superb view of the Bhutan’s Himalayas. Have lunch in Punakha town and visit beautiful Punakha Dzong built in 1637 by Shabdrung Ngawang Namgyal. Based on the prophecy of Guru Padmasambava the dzong is situated between two famous rivers, Pho Chu (Male River) and Mo Chu (Female River). Punakha was also the capital of Bhutan until 1955. Night halt in Punakha. Drive to Paro for 4 hours and check in at the hotel first. Have lunch in the town. After lunch you will visit the National museum, the museum which houses numerous collections of arts and artifacts. This museum is also rated as one of the best museum in Asia. It was originally built in the 17th Century as a watch tower for the dzong below. After lunch visit Paro Ringpung dzong built in 1646 and now serves as head of the administration for Paro district. You can stroll around in the town in the evening for your last minute souvenirs shopping. Overnight stay in Paro. After your breakfast drive till the road end and begin your hike up hill. Walking time will be around 5 hours for a round trip. Taktsang monastery is perched on the face of a cliff 800 Mts, above the Paro valley. It is a memorable spiritual journey. It was here that the great Tantric master, Guru Padmasambhava flew in from Tibet on the back of a flying tigress to propagate his teachings in Bhutan. If you cannot continue your hike inside the monastery, you can stop at the Cafeteria from where you can have a spectacular view of the Tiger’s Nest. Lunch at the cafeteria or you will be served catering lunch from a restaurant. Overnight stay in Paro.